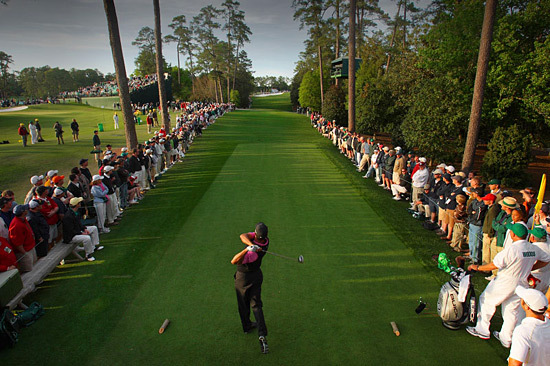 Laforet was able to compose this "Hail Mary" type of image at The Masters using the Canon EOS 1D Mark III's "Live View" mode. When I first heard of the Canon EOS 1D Mark III - the feature that immediately caught my attention was the "Live View" feature implemented in its release. The new body has many new features and improvements over the 1D Mark IIN - but none with as much potential to change remote photography as the Live View feature when combined with the WFT-E2 A WIFI transmitter that allows you to see through the camera's lens, change most exposure and camera settings from your laptop, and also critically focus any lens at 10X magnification anywhere on the image - not to mention of course fire the camera. 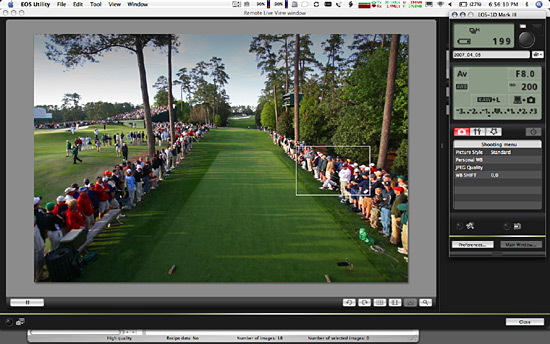 I decided to test these new features out at the Masters' Tournament in Augusta, GA a few weeks ago - as I wanted to find a way to include the fans in the foreground of the image in panoramic "overhead" shots of players. Although I didn't know it at the time, Robert Beck had apparently already tried a similar technique using what some described as a swimming pool pole at other golfing venues - not to mention many other photographers who have placed their cameras at the end of monopods with a set of pocket wizards and shot with fisheye lenses in a "Hail Mary" of sorts. I wanted to take this technique to the next level - by actually being able to more precisely compose the overhead photograph - and to be able to use longer lenses which are inherently harder to compose with and focus. Live View seemed to be the perfect solution to try this out. I ended up using a 24~70mm lens for most of the images - often at 35mm or 50mm - an Apple MacBook Pro laptop, and a 15 foot retractable (and sturdy) Bogen light stand with the legs removed, with a good ballhead. This proved to be a fantastic and stable way of making things work. PocketWizards currently will not fire the camera when Live View is engaged (you get a "Busy" warning on the camera's LCD) - and you therefore have to rely on firing the camera from the laptop. The obvious advantage is that you now simply need to create a computer-to-computer network from your Mac's Airport menu (or PC - I just don't know the specific steps or ease of use in relation to a Mac) make sure you set a static IP address in your network settings - and then connecting to it from the camera is a few steps away - you no longer need to input a complex set of network parameters on your laptop utility that then need to be transferred to the camera via a CF card. Once the camera and laptop "pair" the Canon software automatically launches and you're able to bring up the live preview of what the camera is seeing on your laptop screen - which is fantastic. Two things that I'd hope that the software engineers could change but don't think they can: First, there is about a 1/4 - œ second lag between what the camera is capturing and the image your seeing on your laptop screen - so it's not meant to follow focus during live sporting event for example - the lag is simply too long. Secondly AF is disabled during live view - so again that limits the use of this to fine-tuning of focus and exposure before the event happens. Second there is also a small lag between the time you fire the camera on your laptop and when the camera actually fires - so you'll need to anticipate a bit - which you can get used to. Canon's Live View in action on a compter screen. In the end - the new Connection Wizard and small WiFi transmitter are fantastic new features that while still not "perfect" (due to small time lags between the live preview and firing of the camera) offer photographers some pretty amazing new ways of making remote or macro photographs - wirelessly. The WiFi transmitter also allows photographers to connect hard drives directly to the camera to which images can be recorded to - which is great for studio photographers or remote camera photographers who do not want to (or cannot) change disks regularly. MK III is obviously a new camera despite its appearance. At first glance it looks just like a Mark IIN. But changes in the MIII are first noticed with the menus. They are completely redone and the auto-focus button has been moved. It can be changed back to your usual back button AF point with a custom function. However there is a small learning curve to the new camera. The camera performs noticeably better in low light - with much cleaner images at high ASA settings - making this camera the clear leader of any digital camera in the market - bar none - clear choice for any photojournalist or sports photographer who shoots indoors or at night on a regular basis. The AF is even better than the MKIIN, which is hard to believe - and there is a new custom function that allows you to "micro-adjust" up to 20 lenses in camera - if you find that a lens is either front- or back-focusing regularly. You can now also have your camera write images seamlessly to your SD card should your CF card become full - and you can also in fact make a selection of images off of your CF card and copy them to an SD card (or vice-versa) which is yet another great feature. The LCD screen on the back is HUGE - just amazing, and the battery is half the size of the 1D series and quite a bit lighter. The buffer is also improved - yet I'm sure we'll somehow find a way to continue to fill it - especially with RAW images. The viewfinder is also re-designed and brighter and sharper - they eyecup comes off less easily and the diopter wheel is also hidden by the eye-cup - so you no longer have to tape it for fear of accidentally bumping it. Canon really seems to have nailed every single small detail that we asked them to! I must admit that the only thing that really confused me about this release is why Canon did not name this camera the Canon EOS 2D - given the wide array of new features offered which make this the most significant update of an EOS 1 D series of cameras since the first 1D was released. My personal speculation - and I should be clear here: it's total speculation on my part and not based on any solid evidence - perhaps the EOS 2D will somehow incorporate the shooting of both still and video images - simultaneously - as it definitely seems to be what the market is demanding. When you start to play with the Live View function - you quickly realize how narrow the gap between these new cameras and current HD video cameras is becoming. If you check out the quality of still images of the 4K RED HD digital video camera which is due to be released next month and that of the Canon EOS series - you will start to see a lot of similarities (although the RED camera can shoot at up to 60 fps.) Check out the RED camera at http:///www.red.com/ if you haven't heard of it … it's making waves in the video/film world. Need an event/tournament in West Virginia covered? Click here for a pro! ::..